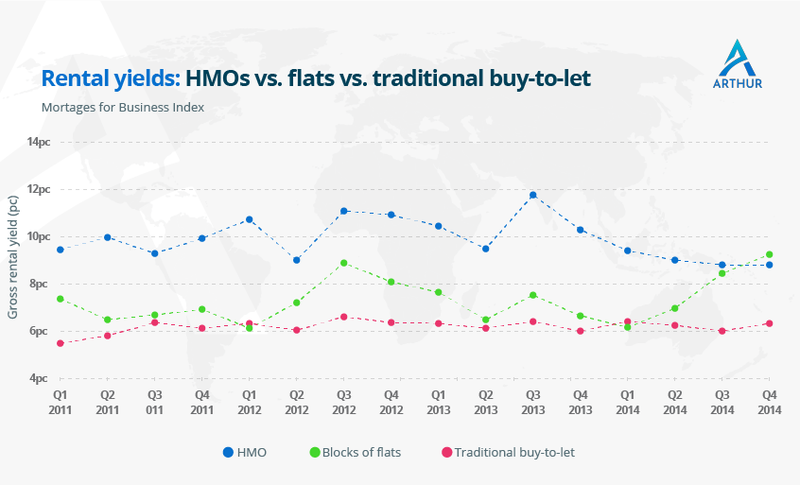 How have HMO’s taken over the property market? Do I need a license for my HMO? What HMO legislation should I be aware of? What HMO taxes and costs should I be aware of? Where is the best place in the U.K. to make a HMO Investment? How Can I find tenants for my HMO? How can I maximise the value of my HMO? What is the best way to manage my HMO? 1. What is a HMO? While local authorities do vary in their criteria for defining exactly what a House in Multiple Occupancy (HMO) is, the generally accepted definition of a HMO is a property rented out by at least 3 people who are not from 1 ‘household’ (for example a family) but share facilities like the bathroom and the kitchen. 2. How have HMOs taken over the property market? HMOs have been the fastest growing housing category of the past 10 years, growing by 25 per cent as reported by Landlord Referencing. The demand for HMOs comes primarily from students and young professionals, who are struggling to get onto the property ladder and so have turned to individually rented rooms as the only way to move out of their family home. The increase in house prices, high living costs and a hike in deposits have meant that young people now feel that the traditional housing market is inaccessible. HMOs are a cheaper alternative to moving out, providing flexible living options for those in social housing, student housings and young professionals. Landlords across the U.K have greatly benefited from the rise in demand for HMOs, as this category of housing often brings double the yield of a normal buy-to-let. Gross rental yields of 12 per cent to 15 per cent are often achieved, in comparison to typical single let properties which have an average yield of 4 to 8 per cent. Void periods are also generally better with HMOs, as even if a tenant moves out, an income can still be made from the remaining tenants. In comparison, a void period for a single let means no money coming in. For similar reasons, there is also less risk of rent arrears. With the rise in demand from tenants and the increased supply from landlords, it’s clear to see just why HMO’s have taken over and transformed the property market. 3. Do I need a license for my HMO? All ‘large’ HMOs in England and Wales will require a license. If you are managing a HMO as a housing association or co-operative, a council, a health service or a police or fire authority, then you will not require a license for your HMO. However, even if your property is smaller and rented to less than 5 people, you may still require a license depending on your district. Therefore, it’s extremely important to check with your local council regardless – some councils require all private landlords to get a licence. HMO Licenses generally last 5 years, although this can be shorter. *When you apply for a license, the council may request other conditions to your license, e.g. improving the standard of your facilities. 4. What HMO Legislation should I be aware of? Being aware of the legal obligations that come with HMO’s is extremely important. Failure to comply with these is a criminal offence punishable by fines of up to £5,000. Not only does the landlord of a HMO have obligations to abide by – the tenant does too. It’s extremely important for HMO Landlords and Tenants to be aware of the regular changes in HMO laws. In the past few years, several major legal changes have been introduced with regards to HMOs, having a direct impact on the presence of HMOs in the U.K property market. In 2010, the government put restrictions on the conversions of C3 family houses into C4 HMO’s by giving local authorities the power to enforce an Article 4 Direction. Officially the Article 4 Direction is “a planning legislation that gives the local council the means to control the number of Houses in Multiple Occupation (HMOs) in their area”.This has been implemented all over the UK, particularly in areas such as Liverpool and Nottingham, where concentrations of shared housing are at their highest and where further development of similar properties may be considered an ‘over concentration’. Purchases are subject to planning permission and it’s not certain whether permission to reclassify use can be obtained. On 1 October 2018 the requirement for what constitutes a HMO was changed as the requirement for a HMO to cover three or more stories of a property has was removed. It is estimated that this change will mean that some 177,000 rental properties will now be classed as HMOs. Tenants may be considered to belong to separate households even if they have a joint tenancy agreement. For example, if a property was let to five students then it would probably be classed as a HMO even if the students took out a joint tenancy agreement. 5. What HMO taxes and costs should I be aware of? A natural by-product of making high profits is high taxes and this is very much the case with HMOs. Most spending on HMOs is a revenue cost, and so income tax-deductible. Items added to the purchase price (capital items) are usually easy to identify, for example building a new extension or taking down a wall. Any ‘repairs’ are considered revenue costs, including all work required to maintain the asset to earn rental income. TIP: Record all your spending’s with receipts in order to support the income tax deduction. Speak with your accountant for more information on guidelines for your HMO to ensure the evidence you have collected supports the income tax deduction. One important thing to note is that because a property rental business is treated as a single business for tax purposes, the tax losses made in current and prior years can be used to reduce the tax bill on HMO rental profits. This is a good strategy for investors with large losses built-up to operate a HMO or two to use up those losses and therefore generate tax-free income. With capital allowances, HMO’s, unlike single let properties, give the ability to claim ‘Plant & Machinery Capital Allowances’. To put it simply, this is income tax relief on qualifying items within the communal areas of HMOs & multi-lets. The purchase and capital improvement costs of the communal area assets are treated as an expense in the capital outlay of the HMO. Generally, rental losses are only rolled forward or offset against future rental profits, however, capital allowances can be offset against non-property income in order to generate a tax rebate. Processing a buy-to-let mortgage application for a HMO takes roughly 96 days, this includes everything from opening the case to submitting the application. The time taken will depend on complexity. It’s likely that lenders will ask for proof of a HMO license – so have this ready before you submit your mortgage application. It could be in your interest to use a letting agent for your HMO, particularly if you are planning to manage your HMO from abroad. Letting agents deal with checking rental payments, renewing tenancies, visiting the property and dealing with any maintenance problems or issues that may arise. However, this does come at a cost. Rates for this can be around 10 per cent to 15 per cent of monthly rent collected. TIP: Those considering a letting agent should use a property management software to enable efficient communication. By using a property management software, you can organise and allocate tasks, such as viewings and tenant complaints. HMOs are inherently risky, so getting the right insurance is crucial. Online services such as Insync could be helpful for you in understanding the process and the unique insurance requirements of HMOs, with access to 5+ specialist HMO insurers. This can allow you to compare cover and prices and get the best insurance deal for your HMO. Maintaining a clean, safe environment is the most important part of renting out a HMO. You should prepare a larger than normal contingency each month for maintenance costs. For example, if you regularly have tenants moving in and out of a HMO, it’s likely that rooms will need to be re-decorated. Another great way to maintain a clean, safe environment is to have a team of contractors in place. This will keep tenants happy and can prevent you from being bombarded with work orders. TIP: Arthur Online lets tenants raise issues, which property managers then review and allocate to contractors they invite to the system. Contractors can give quotes and accept jobs, and keep all parties updated via a dedicated app. Additional services can be added to keep your tenants happy and minimise void periods. Weekend cleaners, for example, are common in shared houses. Cleaners can also be the eyes of the landlord, reporting potential problems. Tip: to encourage a positive environment, include a television package in a communal area! A Netflix subscription, for example, can create bonds between tenants and avoid arguments. 6. Where is the best place in the U.K. to make a HMO Investment? 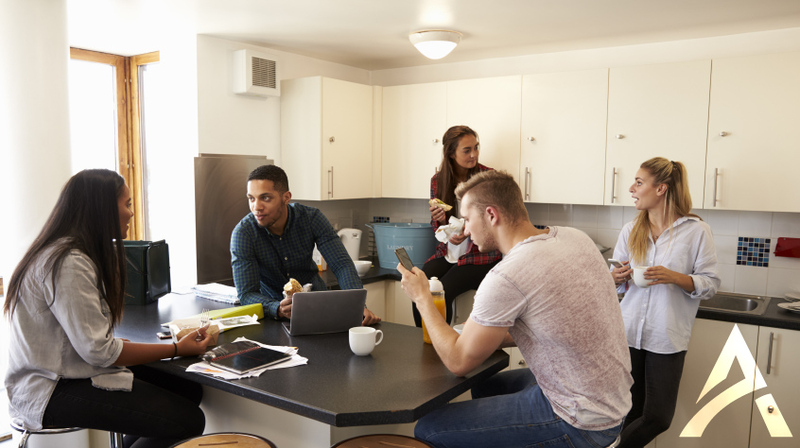 Unsurprisingly, the best HMO investments can be found in major U.K cities and towns as they tend to have the largest population of students and young professionals. The best rental yields are in the North of England. So where exactly should you look? As the unofficial capital of the North, Manchester is the fastest growing city in the U.K. outside of London. Manchester currently offers the highest rental yields on HMO investments.The recent regeneration projects in Manchester have pushed property demand in the city up significantly, including the Salford Quays complex and the digital Northern Quarter. Outside the city, areas such as Salford have seen interest grow recently due to the city and surrounding areas attracting new businesses. Salford’s MediaCityUK became the headquarters of BBC Sport and CBBC in 2011. Property prices are growing by 8.8 per cent per year. The Communities of Interest report in 2016 found that 30 per cent of Manchester’s housing stock is in the private rented sector and the city has a six-figure student population, underpinning demand for HMOs. The city is becoming a popular investment spot not just in the U.K., but internationally, so if you want to take advantage you need to act quickly. Sheffield is one of the greenest cities in the U.K. with over 80 parks and more than 2 million trees and currently offers some of the best returns on HMO investments. The strong demand for HMOs comes from the large student population, as Sheffield is home to two of the UK’s largest universities, yet seven out of ten students in the city have admitted that they do not have access to university-provided accommodation. This number is set to increase further as more international students come to Sheffield – greatly benefiting the local economy. This means there will be even more opportunity for HMO investment. Liverpool is another place with a sizeable student population. Liverpool has recently benefited from large-scale job creation for young professionals, making it the UK’s fastest-growing economy. The recent increase in demand has certainly pushed up property prices, as Liverpool saw a larger annual rise in house prices than any other U.K city between August 2017 and August 2018. Property prices are likely to increase further in the next few years. TIP: use spareroom.co.uk – Rental Index. Not only is SpareRoom a great site for finding tenants, it also provides a free room rental index, which shows the demand for rooms across the country. 7. How can I find tenants for my HMO? Local knowledge is arguably the best advantage of a using a traditional high-street letting agent. Not only will high street agents know what type of HMOs sell in your area, they are likely to have a list of potential buyers looking for what you are selling and can help you market your property to them. It’s important to sign up to an agent that will enable you to reach the type of tenant your HMO is aimed at. Whether you’re looking for students, young professionals or OAPs, choosing the right letting agent can put you in contact with the right demographic. Their biggest selling point is price. Online and high street letting agents use the same marketing tools, so why not go for the cheaper option? Tenants4U is a great website which enables you to advertise your rooms on Zoopla and Rightmove for as little as £30. Here, you can use eye-catching photos and detailed descriptions to really promote your property. Another option is to use GumTree, which offers the same features but has a younger user base, making it especially good for finding students. Asking existing tenants whether they know of someone suitable to rent a room is often one of the most effective (and cheapest) ways of finding new tenants; they are likely to know people in a similar living situation to themselves. Regardless of how you source your tenants, thorough referencing cannot be over emphasised! There’s also an added element of ‘match-making’ when it comes to finding suitable tenants for a HMO, because you need to ensure everyone will get on. Along with referencing, personality checks should be part of your vetting process. Unsurprisingly, issues between tenants is relatively common. TIP: Price Accordingly – the trick to avoiding overpricing (or under-pricing) your HMO is staying in touch with the current market and use comparison sites, such as www.home.co.uk, which provides information on local rents, types of homes for rent, number of bedrooms for rent and how long rental properties have been on the market. You can also access the latest rental statistics for towns, cities and postcode districts across the UK, and from this find the best price for your HMO. 8. How can I maximise the value of my HMO? As a minimum you should focus on getting at least 5 tenants in each HMO to successfully spread the cost of electricity, gas, water and council tax to create a healthy profit. If the first 3 tenants cover your costs, further tenants mean profit. You can extend your property by either a one or two-story extension. Another option is to create an extra communal space, a common way of doing this is by building a conservatory. Conservatories have great value potential. If your property already includes a large kitchen, you may combine it with a spacious conservatory and create the primary communal living space in your HMO. This will allow you to convert the other communal space, usually the living room, into an extra bedroom. You could also do this with an unused garage. This is a simple, cost-effective and efficient way to increase the value of your HMO. The returns you can generate from some simple interior design changes are high, so it’s well worth considering. If you don’t want to go down the route of building a double story extension, or the hassle of converting a garage, then something as simple as one or two interior design tweaks can make a huge difference by increasing the amount of rent a tenant will be willing to pay. c) Take high quality photographs! As you start researching HMOs, something that you will find is that the rooms on offer tend to be very standard and often quite dull. In typical HMO promotional photographs, you might see a bare mattress or a non-made up sofa bed. Furthermore, there might be a lack of furniture or evidence that the rooms haven’t been painted recently. You should always aim to stand out; your staging photographs used in promotions are very important. 9. What is the best way to manage my HMO? For those considering entering the HMO market, it’s important for you to realize that making your initial investment and finding your tenants are just the first steps in making your HMO a success. Depending on your strategy, managing a portfolio efficiently is arguably the most important and time-consuming part of being a property investor. Luckily there are a range of cloud-based property management platforms that can save you time and money. Choosing the right rent, arranging tenant applications, collecting rent and managing maintenance issues, all need to be managed efficiently to keep tenants happy. Property management software can really help cut costs. One of the most useful features of property management software such as Arthur Online, is automation. Using Arthur Online decreases the need for communication for both property managers and tenants, by implementing a streamlined process. The automation aspect also runs through the documents stored on the system. For example, reminders can be set to renew GSCs. In any HMO, maintenance issues and check in/out needs to be managed efficiently. When an issue is raised, there needs to be a process to track and monitor progress and to keep the relevant parties updated. Arthur Online keeps everyone up to date with a dedicated suite of apps for the property manager, tenant and contractor. When communicating with other parties such as tenants, the platform gives the property manager complete control over communication channels. Additionally, you can send automated e-mails each month reminding specific tenants to pay rent. In the same way you can select which tenants receive messages, you can select which members of your team are allocated tasks, viewings and tenant complaints, giving you greater control over how these processes are handled. The suite of Arthur Online apps available makes the overall process of managing your HMO much smoother. Via the various apps, tenants can raise issues, letting agents can arrange viewings, contractors can accept work orders, property owners can view statements and property managers can oversee everything.